Welcome to the Crazy Crafters Blog Hop with our Special Guest stamper, France Martin (perhaps better known as Frenchie!) - we are thrilled to have her join us this month and so excited to CASE (Copy And Selectively Edit) any project that has been created by her. We hope you find great inspiration from the projects. I have been enjoying and learning from the Frenchie tutorials for several years - especially the videos (who doesn't love that gorgeous accent!) so this opportunity has been very exciting for me. But it did pose a problem when selecting a project to CASE - there are just so many that I love! Eventually I decided to opt for something that I hadn't done before and chose the Joseph's Coat technique (I assume named after Joseph's Coat of many colours). 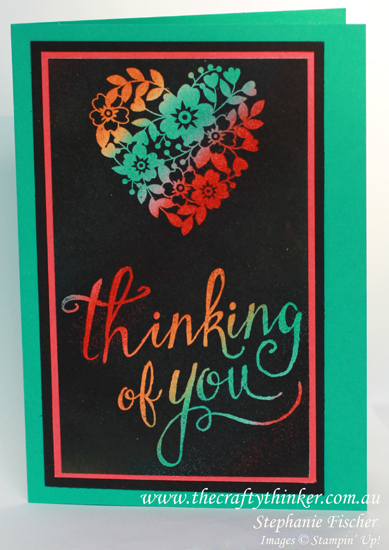 France has a great tutorial over on her blog - just click on the image of her card, to the left, to follow the link. Since it was my first attempt at this technique - I kept it simple and used only two stamps - the heart from Bloomin' Love and the greeting is from the Hostess set Time of Year. Unlike France, I sponged the colours onto Shimmery White cardstock with a sponge dauber. My first plan was to place the colours randomly but, as you can see, I don't do random very well! I ended up sponging diagonal stripes in Peakaboo Peach, Bermuda Bay and Watermelon Wonder. I made sure the ink was dry before giving it a quick wipe with my embossing buddy and then stamping with Versamark and clear heat embossing. 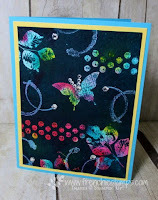 Once the heat embossing had had a couple of minutes to cool, I sponged over the entire project quite heavily with black ink and then used a tissue to wipe the ink off the heat embossing to reveal the pretty colours. From my personal (and painful) experience, allow me to give you a tip: use Memento Black ink. On my first piece, I made the mistake of using Basic Black Archival ink and was unable to properly clean it off the embossing! I layered my Joseph's Coat panel onto Watermelon Wonder and then Basic Black cardstock before placing it onto the front of my Bermuda Bay card. I really enjoyed this technique (although I ended up with very inky fingers!) and I know I'll be doing it again very soon. Thank you again France Martin for your wonderful inspiration!